How do you optimize the revenue generating resources in your organization? What can be done to lower the cost of new talent acquisition? How do you increase the accuracy of your sales forecast? What would be the improvement if you followed predictable sales process? What actions would ensure you maintain sales performance at high levels? Diagnosis before prescription. 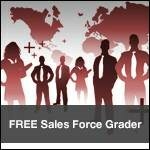 Before you can effectively improve the performance of your sales team you must uncover the weaknesses common to your salespeople, the hidden problems of which you weren't aware, the business being lost because of those problems and learn what changes that must be made to your sales management processes and systems. The award winning OMG sales team evaluation is a collection of information about your company's sales organization, evaluated from an all-inclusive perspective. Using the information collected from individual evaluations and executive level input, the sales team evaluation reveals the action plan you can implement to achieve the improvement. You have identified inconsistencies in your value proposition and have a plan and timeline to correct them. A detailed plan of action has been created to improve the hidden weaknesses within your sales team and a step by step method to execute that plan. Worries and concerns that have been suspected are confirmed or negated using proven scientific and time-tested tools. Certified consultants explain the meaning and impact of the findings then work with you to develop and execute a step by step improvement plan for your team.